Cooks often attempt to lighten up coleslaw by removing the mayonnaise from the dressing. But why take away the joy? Instead, lighten it by replacing the sturdy cabbage with crisper, featherweight napa cabbage. Here, sliced almonds and sesame seeds add a little crunch and heft, and ginger brightens up the dressing. Add as much mayonnaise as you like. A giant dollop, you crazy cat! See the recipe (and print and save it) here. i have a similar slaw I make that doesn't include mayonnaise. Instead, it calls for red wine vinegar and the seasoning from the ramen noodle mix. The noodles and the almond slivers are put in the oven to get a little crispy and crunchy! We loved this recipe! Thanks for posting! Glad to know -- and thanks for trying it! With a not-getting-any-younger head of Napa in the fridge, I tried this with what I had on hand. Thought I had sesame seeds, but no. So, subbed a tablespoon of peanut butter and a few drops of dark sesame oil into the dressing. Many thanks to the reviewer who suggested mint instead of basil. Another reviewer liked it with much more almonds, so threw in the rest of a container from Trader Joe's, about 1/2 cup. If this recipe is better as written than it was with all my crazy substitutions, my husband will eat it every night. Just delicious, thank you for a new twist on cabbage! Thanks -- love all your improvisation! Love the ginger and lemon, but I'm allergic to nuts. How do sesame seeds sound as a replacement? Ooooh! Love it! Thank you so much! On the lunch menu for Thursday. I made this for brunch today and it was the best thing on the table. Misread the recipe as 1 and 1/2 cups almonds, and it was delightful that way. Subbed in mint for the basil because I was already serving something with basil, and the mint was great, too. Thanks for the recipe! Napa cabbage does well with lots of nuts -- it's so light that it seems to welcome their richness. 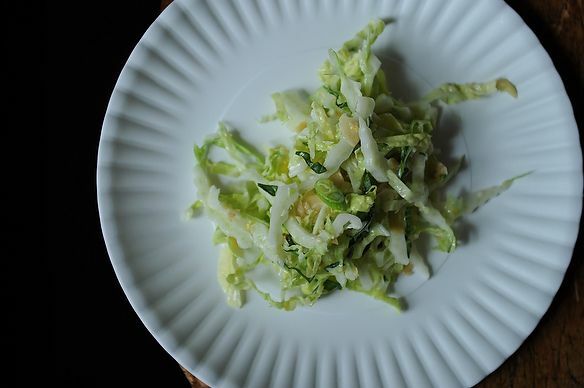 I love the idea of lightening up the slaw with a different cabbage. I had great success this week using a mandolin to thinly slice a purple cabbage. The finished product turned out light and ribbony simply by slicing it as this as possible. Yes -- that's another great way to go about it. Thanks. Thanks, Amanda. Sounds yummy. That plate! looks like paper, but it's not? so cute. and that cabbage looks like Audrey II's head.